Choose your desk frame's color to match your office decor. We have accessories to match your frame color, too! Our 27.5" feet work for most desks, but for desktops with depths less than 28", we recommend picking the 24" foot option. Add a free accessory to your order, on us! Outfit your desk frame with the promo item of your choice. Choose your UPLIFT V2 Commercial Frame in black, gray, white, or metallic (industrial style) finishes. A quick note about our metallic (industrial style) frames: Our metallic (industrial style) frame's finish is designed to have an industrial aesthetic, giving you an intentionally imperfect finish that shows off the character of the frame's raw steel legs and feet. That means that no frame will look exactly like another, which is ideal if you're searching for a desk that's truly as unique as you are. Looking for a uniform finish? We recommend our black, gray, or white frames, which are powder-coated for a more consistent finish with no color variations. Take a break at your height adjustable desk and with a complimentary Under Desk Hammock. This fun desk accessory is designed to attach reliably to built-in mounting points on our V2 standard desk frame, and lets you rest comfortably under your desk. UPLIFT Desk feet are available in two sizes, so that the frame doesn't stick out from underneath your desktop and get in the way. Our UPLIFT tablet stand is the ideal solution for notebook and tablet users looking to adjust the viewing angle and height of their screen. The stand features seven support angle positions, and its lightweight-yet-sturdy construction makes it perfect for travel. Get your frame even quicker by adding our expedited production option. Order your frame by 3 pm Central on a business day and we guarantee to start production on your order and ship it the same day. If placed after this time, your order is guaranteed to ship the following business day. If your selected frame is not in stock, it will ship per the above guidelines as soon as it arrives. The lower stability crossbar on the UPLIFT V2 Commercial Frame helps provide a sturdy workspace at any height. The UPLIFT V2 Commercial Frame, when paired with a 1"-thick desktop, conforms to the ANSI/BIFMA G1-2013 Height Standard. ANSI/BIFMA G1-2013 Height Standard UPLIFT V2 Commercial Frame is ANSI/BIFMA G1-2013 Height Standard compliant. Click here to learn what that means. Click here for FAQs for our UPLIFT V2 Frame and UPLIFT V2 Commercial Frame. What are the benefits of the UPLIFT V2 Commercial Standing Desk Frame? Our UPLIFT V2 Commercial Standing Desk Frame comes with a 22.6" - 48.7" height adjustment range, making it ANSI/BIFMA G1-2013 compliant. Our designers included a stability crossbar to further stabilize the UPLIFT V2 Commercial Frame, which does not come with a stability brace. Larger legs feature a 35% thicker cross-sectional area where the legs meet the desk foot, boosting desk stability even more. You'll get the same great features, too, like accessory mounting points, superior Anti-Collision Sensitivity and Keypad Lock, and included wire management on the UPLIFT V2 Commercial Frame. Our UPLIFT V2 Commercial Frame option is ideal for offices that comply with BIFMA standards of height and stability. What desktop sizes can I use with this frame? The UPLIFT V2 Commercial Standing Desk Frame is designed to work with almost any desktop size, as long as it's stable on the frame. This frame is also designed to be compatible with all UPLIFT Desk tops 42" through 80" wide. Why should I choose the UPLIFT V2 Commercial Standing Desk Frame over the UPLIFT V2 Frame? While our UPLIFT V2 Frame works well for just about everyone, some users prefer this commercial frame. The UPLIFT V2 Commercial Frame was designed with a slightly modified height range of 22.6" to 48.7" with a 1" desktop installed (2" lower than our standard desk) that works well for offices that choose to meet the ANSI/BIFMA G1-2013 height standard. Our UPLIFT V2 Commercial Frame also allows users to add casters to their desk while still achieving a low enough seated height for shorter or petite users. Others choose it because they appreciate the crossbar and the look of the larger lifting columns. 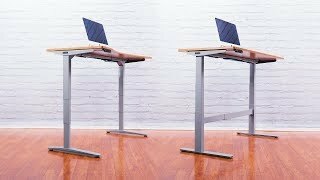 Does the UPLIFT V2 Commercial Standing Desk Frame have the same features as your standard desk frame? Yes. Although the upper and lower height limits are different (24.5" to 50.1" tall without desktop on the UPLIFT V2 Frame and 22.6" to 48.7" tall without desktop on this UPLIFT V2 Commercial Frame), both offer a similar height adjustment range of about 26". Both frames also include 48 patent-pending integrated accessory attachment points for easy attachment of both current and future accessories, a telescoping design that adjusts to fit tops from 42" to 80" wide, and a wire management tray that helps contain loose wires and can hold a surge protector outlet strip. What are ANSI/BIFMA G1-2013 and X5.5-2014 standards? The ANSI/BIFMA Durability X5.5-2014 Standard ensures that both of our UPLIFT V2 Frames meet and exceed strict tests of desk loading, racking, leg strength, vertical adjustment, and cycle testing. In addition, our UPLIFT V2 Commercial Frame meets or exceeds the ANSI/BIFMA G1-2013 Height Standards, meaning that it has a height range of 22.6" to 48.7" (with a 1" desktop installed), which accommodates a seated 5th percentile (5'0") to a standing 95th percentile (6'3"). This BIFMA Height Standard is important for offices that wish to comply with this standard, and for users who are either very petite or very tall. Why does the UPLIFT V2 Commercial Standing Desk Frame have a crossbar? Some desks that meet the reduced seated height requirement of the G1-2013 standard are not stable at their tallest standing height. This is due to the reduced overlap between the lifting column's three stages, a drawback to lowering the desk's minimum height while still attempting to maintain a wide height range. Our designers added a solid steel crossbar to reduce side-to-side movement and redesigned legs with a 35% thicker cross-sectional area than our legs on the UPLIFT V2 Standing Desk Frame to maximize the stability of this contract-grade frame. This crossbar also telescopes to fit desktops 42" to 80" wide, so you can swap tops if you ever need to. Assembling the frame and attaching it to the desktop can be done by one person. However, depending on the size of your desk, you might need two people to lift the desk and place it upright after assembly. Wanna see how it's done? Watch Gene assemble his UPLIFT V2 Standing Desk in fewer than 7 minutes. Height Range with 1" Desktop 22.6" - 48.7"
Desktop Width Range 42" - 80"